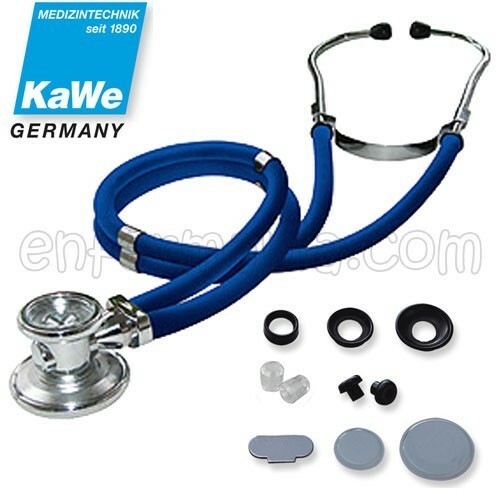 Double bell/diaphragm and double tube of 55 cm, a classic within the stethoscopes. Greatly versatile, it is supplied with two membranes (a child of 27mm and the other for adults Ø40 mm), and allows you to attach a hood in the place of its smaller aperture, making it a fonendoscopio membrane-hood, or use it with two membranes. Auscultation for one or the other diaphragm is interchangeable, by turning the metal piece (as any stethoscope double-head). Manufactured in chrome-plated Zinc alloy (for maximum durability and brightness).